8-01-16 - Rick has some comments in David Schneider's cuke interview. 1-07-14 - The Edward Conze audio files replaced with noise reduced MP3-320k versions worked with by Charlie Wilson now at the Cuke AV Center. 9-09-13 - Emminent Buddhist scholar Dr. Edward Conze MP3-48k audio sent by his student Rick Levine - a talk Conze gave at the SFZC City Center around 1972. 9-05-13 Rick Levine with Charles Leong (audio) MP3-24k (7.5 Mgs) - MP3-48k (15 Mgs) - Once Leong starts talking about fishing he doesn't change the subject till the end. In the last few seconds his voice speeds up humorously beyond comprehension due to battery death at time of recording. Rick sent me this tape to digitize partially so David Schneider could listen to it as David went to Reed College and is working on a bio of Philip Whalen, another Reedite. I looked into who Leong was and found this: Gary Snyder learned calligraphy from an older Reed friend, Charles Leong, a Chinese American who served in World War II. Rick writes: Chas. was a GI Bill reed student friend of Phil/Gary/Lew, early 50's. Gary wrote "to the Chinese comrades", poem, mentioning chas. He was native Chinese, my unofficial mentor at Reed. Lew Welch wrote about him as well. I'm astonished at how "legible" the audio file is--I listened all the way through and pretty much decipher every word. The discussion took place roughly August of 1979 at Charley's home in Portland OR--that makes it 34 years ago on an old cassette. Rick also sent this audio for talk from Lloyd Reynolds at the SFZC City Center. Student: Sometimes I get lethargic and discouraged about life and practice. Roshi: This is good. We must stand for improvement exactly where our problem is. All practice has these moments. 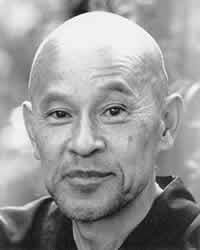 Once in a lecture Suzuki Roshi said, "There is double difficulty for new students. Older students should help new students, make practice easier for beginners. There is also double difficulty for older students." Once when Suzuki was quite sick and being helped to a bed, he said, "Now I can be a little child, I don't have to be a Zen Master." 6/14/04 - From Two Jobs for a Monk - Dr. Rick Levine adds that he remembers a lecture given by Richard Baker at the SFZC wherein he said that Gary Snyder had gone to his teacher, Oda Sesso, and said that he was involved with work like environmentalism and what did Sesso think of that and that Sesso replied that there are two jobs for a monk - sitting zazen and sweeping the temple.